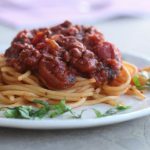 Slow Cooker Spaghetti Sauce is one of the most simple and popular dinner dishes in my recipe files. It takes just a few minutes to prepare and can be served in less than 30 minutes start to finish. 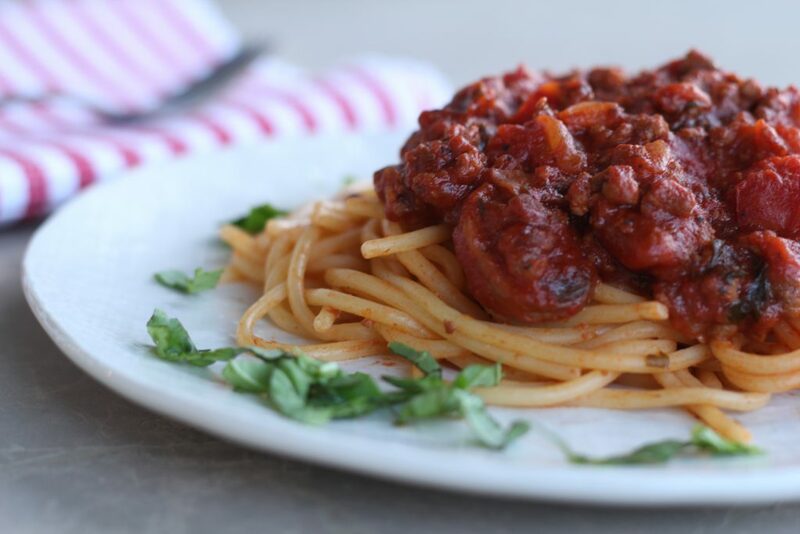 All of my family loves spaghetti with meat marinara and I love the simplicity of this delicious homemade meal. If I have a busy day, I assemble the Slow Cooker Spaghetti Sauce in the morning and place into the slow cooker and turn it on low. At the end of the day all that’s required is cooking the pasta and throwing together a green salad. It doesn’t get easier than that! Slow cooking all day will allow the flavors to develop and your sauce will have a deep, rich, color and flavor. That said, I’ve made this spaghetti sauce and served it 20 minutes later more times than I can count. Either way, it’s always a crowd pleaser. Saute ground beef and Italian Sausage until browned. While cooking, season with salt and pepper. Add olive oil to pan and chopped onion. Continue to saute until onion is soft. Add garlic, chopped tomatoes, tomato sauce and paste. Stir until blended. If cooking in slow cooker for the day, Turn on low and cook for 8 hours. Just before serving, add 1/4-1/2 cup of the pasta water to the sauce and 2 tablespoons butter (optional). If making the sauce for a quick dinner, start boiling water for the pasta when the sauce is being assembled. Once the water begins to boil, cook the pasta according to package directions. The pasta and the sauce will be done close to the same time. -I use extra lean ground beef most of the time, but also occasionally use half Italian Sausage and half ground beef. I also like to mix it up a bit and use link Italian Sausage in the sauce. Cook the link sausage in a pan, remove from pan and slice. Add to the sauce just as you would the ground cooked meat. Any combination of meat will work, 1-2 lbs total. If you are going to cook the sauce in a slowcooker and not serve immediately, cok the ground meat and the onion together and throw all into the slowcooker when the meat is browned and fat drained. Then simply add the remaining ingredients. Cook for 8 hours on low. When fresh herbs are readily available, fresh is best but dried herbs work well in this recipe. Butter will greatly improve the flavor of the sauce and help bind the sauce as well. Not necessary, but highly recommended. Pasta water is the water in which the pasta was cooked. After the pasta is cooked remove some of the water to add to the sauce. We love mushrooms and often add 1 lb sliced fresh mushrooms with the onions. I often double this sauce and freeze half for another dinner. This looks really good and is one you can do to cook while you’re at work. Brown meat, saute onion, and combine all other ingredients in the slow cooker the night before. Then the next morning, remove from fridge and get it going. All your clean up is done the night before, so your meal will be simple when you get home from work! Thanks for your notes, so helpful! Can’t wait to try! This is now in our monthly rotation! Thank you! We loved it! Thanks for sharing your recipes! 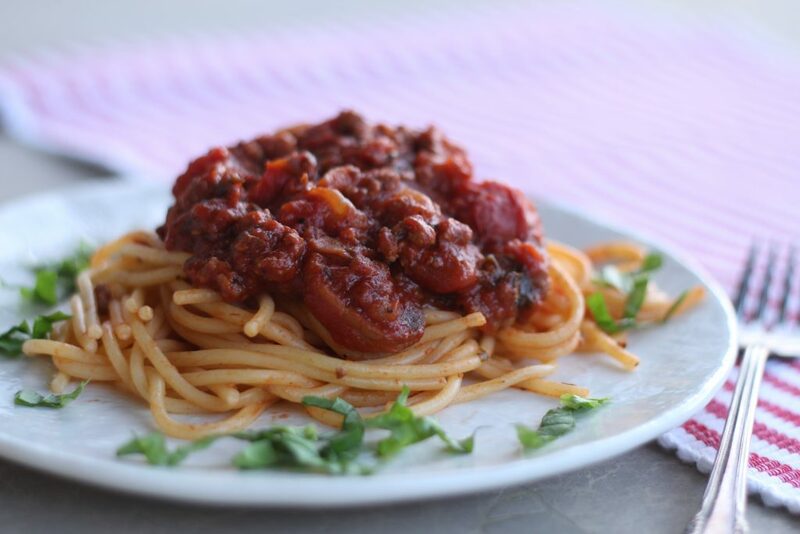 I have tried a whole bunch of different spaghetti sauce recipes. This one is my favorite. My whole family will eat it. I love that it cooks in the crock pot so it is ready at the end of the day when kids are going all directions. I love when I can find a recipe that will go into our rotation. Thank you!! It was so good. I’ve been searching for years for a spaghetti sauce we all love and this is it!! I love that it can be made in the slow cooker too. I’m glad this recipe was a hit with the whole family! It’s great to have those go-to recipes you know everyone will love. Thanks for your positive feedback and thank you for reading ABK. 2-3 hours on high is the equivalent of 6-8 hours on low. All crockpots are not created equal, so that’s a round figure. What if you don’t want to put the meat in? Do you think the sauce works well if you leave that part out? Hi Tammie, the sauce will have a thinner texture if you choose not to put the meat in. So if you want it to be thicker/chunky, I would put some veggies in it as a substitute. Hope this helps and thanks for reading ABK! Hi! Do you have any suggestions for cooking spaghetti or angel hair for a crowd of about 50? I have done spaghetti casserole for a crowd but never the pasta (to be served with several different sauce choices) and I’m worried about clumps of cold pasta! I know you’re a pro at church parties and would love any tips! 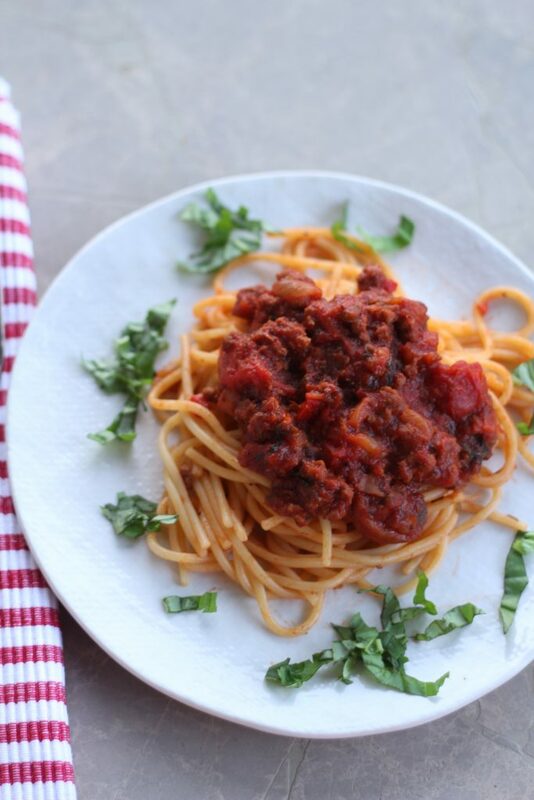 My husband’s favorite food is spaghetti and after spending the last couple of years trying a bunch of different recipes, we’ve decided this is our most favorite. Besides being so delicious, I love the ease of putting everything into the crock pot and letting it simmer for just a few hours or longer if I have the time. 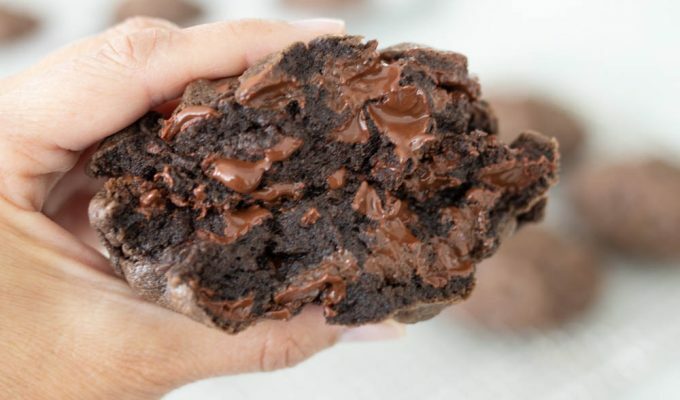 I also love that it uses “pantry” ingredients that I almost always have on hand – and that this recipe makes enough that I can freeze half for another day. Hi Jeanelle, this is definitely one of my favorites. I love how easy it is to throw everything together at once. I’m so glad your family enjoyed it as much as we have. Thanks for sharing!